…and it’s all about perspective. Last month, the daughter of one of our neighbors (U.S. Air Force Lieutenant General, Susan J. Helms) came to our community center and spoke about her “walking in space” experiences. That is, indeed, a unique perspective that few of us earthly inhabitants will ever know. And yet, it was so easy for every person in the room to identify with her—to grasp the concepts she spoke about. 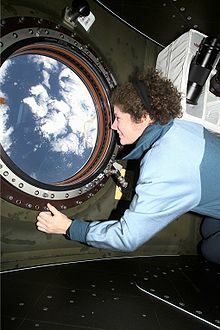 From expressing her excitement about the Space Program, Shuttle flights and her months aboard the International Space Station, to her world record 8 hour and 56 minute “walk” in space, her perspective filled the imaginations of every listener. It was an honor for me to attend that gathering and meet such an extraordinary person. That brief encounter with someone who has actually gone into Space—as I’ve occasionally dreamed of doing—also brought back marvelous memories of the Space Adventure books I’ve read over the years. Possibly my favorite (and I say possibly because I have so many favorites) is The Mote In God’s Eye by authors Larry Niven and Jerry Pournelle. Yes, authors can work together to create a truly amazing novel—one that is more complete, more fully developed than if they had attempted it on their own. This novel was first published in 1974 and I read it shortly thereafter, but have not re-read it (although as I’m writing this I know I will be reading it again, soon). Yet, I can still recall vivid images that the writing produced in my mind. Can you imagine it; society in the far distant future of 3017 when the people of earth have been involved in an “interstellar war?” Can you see the image conjured by the title; a blazing red supergiant star with a yellow (sun-like) star visible in front of it—looking (perhaps) like the Eye of God? Do you perceive the conundrums being flung between the science and technology of space travel and human belief systems? Can you imagine the rational (and irrational) need within human nature to know more—to go there? And where do the human elements of faith, hope, love, integrity, greed and the hunger for power, prestige and fame intersect within this scenario? Yes, I hope you will read this science fiction adventure novel. But MORE than that, I hope you will write your own—yes—even collaborate with another writer whose imagination carries them “out of this world.” There is something inexpressibly marvelous that takes place when two writers work together toward a common goal—with THE END of the story in mind; when both writers hear themselves saying, “Yes, YES, that works!” and the plot moves forward in new, exciting and unexpected ways. That is what I feel when coming along side an author as a ghostwriter/consultant—a unique element of JOY! And that is what your team of self-publishing co-laborers feel, too, seeing your book(s) through the production process and IN the hands of readers. Next Next post: Are Self-Published Authors Successful?